Daniel Libeskind is well known for his intense professional activity of recent years, following the completion of his opus magnum, the Jewish Museum of Berlin, first hailed by Bruno Zevi in the book Ebraismo e architettura as the opposite of a traditional building, “a zig-zagging, wriggling body that darts, whips into the city, magnetizing its narrow spaces and open areas, electrifying them, challenging stagnation and stillness. Expressionism on a metropolitan scale, no longer content to yell, determined to re-evoke horror in a cold, cutting, merciless way”. The first draft of his famous project in Berlin was temporarily titled Line of Fire, a reference to the legendary origin of architecture as told by Vitruvius, and the Italian book which has just been released by Quodlibet brings to light the hidden, more intimate and unseen side of Libeskind’s work. His training included those encounters with music that began when he was quite young, his long-distance conversations with such great philosophers as Jacques Derrida – as Dario Gentili recalls in his afterword – and above all art and drawing, which are enjoying a surprising renewal of interest in today’s architectural culture. 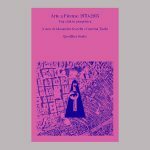 The virtuoso series of drawings Micromegas (1979), Anatomy of Melancholy (1981), Chamber Works (1983), Theatrum Mundi (1985), Sonnets in Babylon (2011), most of which have never been shown before, are in fact inseparable from the reflection on great themes that reverberate in his architecture: space and negative space, memory and emptiness are the conceptual fire beneath these rhapsodic writings. Due to his little-known, “almost mercurial” partnership with Aldo Rossi – to whom the appendix is dedicated, complete with the “machines” built by Libeskind for the 1985 Biennale – he moved to Italy for a number of years. 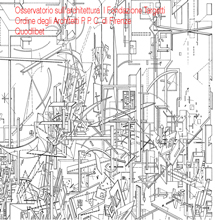 The Osservatorio sull’Architettura will discuss the profession of architect of today with Libeskind along with the Mayor of Florence, Dario Nardella; Pino Brugellis (Osservatorio sull’Architettura); Manuel Orazi (architecture historian); Shulim Vogelmann (author and editor at La Giuntina); and Alessandro Jaff (Florence Architects’ Professional Association). The underlying idea is that making architecture is not just a matter of construction but also, and above all, one of writing, drawing, experimentation and constant translation between all these forms of knowledge.